Sierra Leone and her two neighboring sister Republics of Liberia and Guinea, all in the Mano River Union (MRU), are facing serious challenges in their health sectors, following the Ebola Virus Disease outbreak. The Republic of Sierra Leone in particular, has witnessed deaths of hundreds of its citizens, notwithstanding President Ernest Bai Koroma’s government doing so well to face this terrible Ebola pandemic. As recent as a week ago, I outlined the tremendous efforts undertaken by the government of Sierra Leone to address the current Ebola Virus Disease and its challenges. I referred to the establishment of a Presidential Task Force and the Emergency Operations Center (EOC); disbursement of billions of Leones towards the eradication of this pandemic; declaration of a state of public emergency by the President; declaration of a day of national reflection; calls for sensitization and public education; decision to quarantine epicenters, to mention a few of the very numerous robust interventions of the government of Sierra Leone. Yet again, the role of our international development partners comes into play, especially, the world powers. China and Sierra Leone have had long standing cordial and unbroken ties lasting close to half a century. These years of strong and unbroken friendship have been based on the policy of equality and non-interference. It is believed that the visit of then Chinese President Jiang Zemin to six African nations in 1996, marked a shift in focus of China’s relationship with Africa, away from politics towards economics. China has a traditional history of sturdy and uninterrupted people-to-people and diplomatic ties with Africa that have lasted for decades. Its development cooperation framework is tied mostly in the areas of social and infrastructural development, and win-win-cooperation at both the bilateral and multilateral levels. Since the outbreak of the Ebola Virus Disease, the People’s Republic of China continues to stand by Sierra Leone and all countries affected by this pandemic. 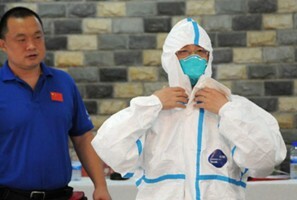 In August, the Department of International Cooperation of the National Health and Family Planning Commission of the People’s Republic of China sent to the Republic of Sierra Leone, eight personnel of the Chinese African Aid Expert Team to support Ebola Virus Disease control and laboratory investigation. And during the same month, China airlifted to the Republic of Sierra Leone, various medical supplies worth 10 Million Yuan to fight Ebola. These supplies included medical protective clothes, disinfectants, thermo-detectors and medicines. By way of further timely assistance, during the same August month, the People’s Republic of China again sent an expert team of three doctors to Sierra Leone to help contain the spread of Ebola Virus Disease. 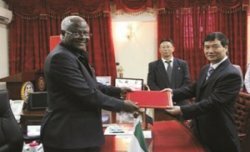 At the request of the Government of Sierra Leone, the People’s Republic of China sent a mobile laboratory testing team to Sierra Leone on September 16. “The team, equipped with 59 medical experts who specialize in laboratory testing, epidemiology, clinical medicine and nursing, will help Sierra Leone in testing for the Ebola virus. The Team is working at the China-Sierra Leone Friendship Hospital at Jui, just outside Freetown, helping the country in the areas of laboratory screening and observation of suspected cases of Ebola. 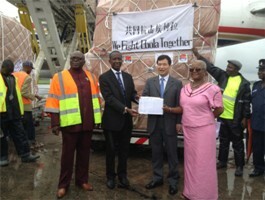 “On the 17 September, 2014, China air lifted to Sierra Leone, two chartered planes, carrying a China Center for Disease Control and Prevention (CDC) laboratory team and a China-Aided Mobile Laboratory as further support towards the country’s fight against the Ebola and in response to appeal from the UN and WHO to support Africa in controlling Ebola”. Just days ago, China announced a further 200 million Yuan ($32.54 million) package of humanitarian aid to the countries affected and International Organizations to help control Ebola. The Aid is expected to include “Food, supplies for disease control, emergency treatment facilities, and capital support”. Also, in helping to build Sierra Leone’s human resource capacity, a total of 30 Sierra Leonean students from various fields of academia, arrived in the People’s Republic of China on the 5th of September, to further their education. Among the 30 students, 2 will pursue Ph.D., 7 will study towards their Bachelors Degrees and 21 will pursue Masters Degrees in different fields, including Communication/Information Technology, International Relations, Public Administration, Engineering, Clinical Medicine and Agriculture. Without doubt, the People’s Republic of China has stood outstandingly, very solidly, in the fight to eradicate Ebola. Sierra Leoneans will forever remain grateful for their timely and appropriate interventions. MRU nations must keep hope alive. Africa is a great continent of immense potential.